Kevlar is great stuff. You may well find it in your gloves or even your upmarket leathers, but it is best known for being used in bulletproof vests and helmets for the Army. Anyway, it's made by DuPont and it's been in commercial use since the mid 70's. Now you'll be used to seeing bikes with chains and with shafts. Everyone knows that a well maintained chain is probably the most efficient way you'll get of transmitting power. But who keeps their chain in perfect condition all the time? Chains need adjusting and oiling, which is a pain in the neck. Shafts do away with the need for such regular maintenance but they are heavy and sap power. Belt drive gives almost the same efficiency as a chain, it never needs adjusting or lubing and it's completely silent. The belt is toothed so that it doesn't slip and is reinforced with Kevlar so it won't break. And it won't either - the US Navy use Kevlar ropes rates at 22,000 tons to secure ships. 1203cc air/oil cooled vee twin with electronic sequential fuel injection, 5 speed gearbox and kevlar/carbon fibre final drive belt. Mass centralized underslung exhaust with power valve. Aluminium perimeter frame with self contained fuel tank. Single rear shock and 43mm cartridge forks. Adjustable preload, compression and rebound damping. Single 375mm ZTL floating front disc with 6 piston caliper. Single floating rear disc with single piston caliper. It's funny but it often seems to be the case that siblings, even very close ones, have markedly different character traits. One may be academic while the other is sporty. Perhaps one is well behaved while the other is a little, um, unruly. And at the same time they will frequently have notable similarities as well. Perhaps the same tastes in clothes or music or food. Buells are like that, too. Here we have a pair on non-identical twins. On one side the unruly and frankly slightly mad Lightning, and on the other this, the sportier but far more sensible and well mannered Firebolt. 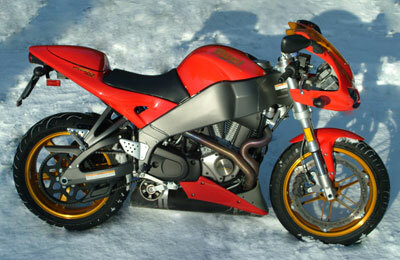 Now don’t get me wrong here, the Firebolt is only sensible by Buell standards. For anyone else it’s still as mad as a tuned 1200cc Harley engine bolted into a 250 frame could be. Inevitably, given the shared genes, there are a lot of core similarities between the two bikes. Having reviewed the Lightning in detail, I'll get the technical bits out of the way here. 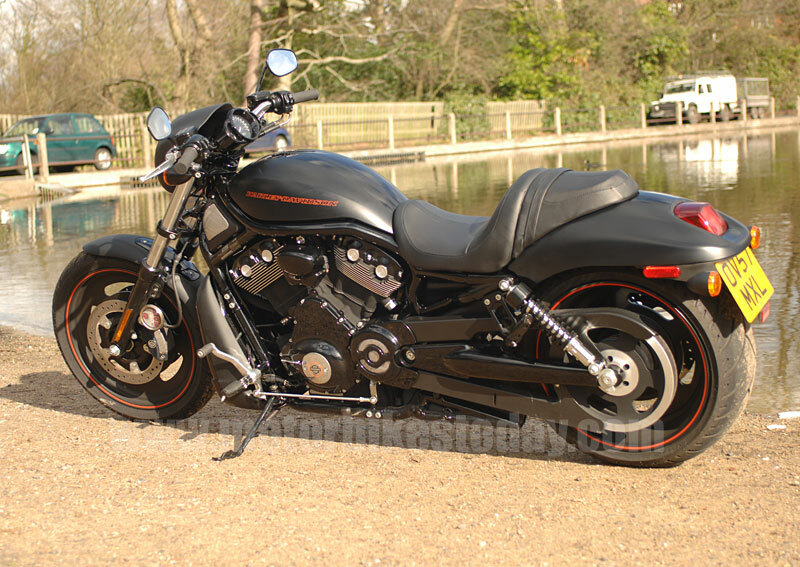 The Firebolt has a mildly tuned 1200cc Harley engine and gearbox. That’s not modern technology, and it shows at times, despite the 21st century addition of fuel injection. The exhaust is directly under the engine, exiting to the left. Like all current Buells, the fuel tank is in the frame and the oil is in the swingarm. Braking is taken care of by a single rim mounted front disc while drive is delivered through a large, toothed Kevlar belt. 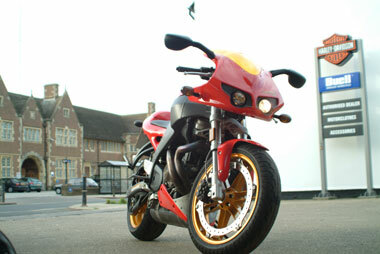 That’s just about where the similarities end, though, as the Firebolt is a sportsbike of the clipons and rearsets mould. The lower bars not only completely change the appearance of the bike, they completely change the riding experience as well. The Firebolt, far from being an unruly wheelie monster like its brother, is as well planted at the front as the best continental offering. There is an immense amount of feedback available through the bars and the seat, and the rider always knows exactly what is going on. And, more to the point, what is coming next. A statement which might not always be true with the Lightning. On the road the riding position makes itself known in the form of stiffer wrists and slightly more effort in turning. At least until speed builds up a bit and lets the airflow take some of the strain. In fairness, it was never a big deal but if you only ride around town then it might become one. The fairing, as well as looking great, does a remarkably good job of deflecting the elements as well as holding the mirrors in such a position that they actually do something useful. The lights, while managing to resemble the bulging eyes of some giant carnivorous insect, make the road ahead sufficiently clear to prevent darkness from interfering with a good ride. Did I say a good ride? My mistake. The Firebolt is a great ride. Handling is fantastic, needing a firm nudge to turn in but repaying that with rock solid stability, both bolt upright and on its ear. Ground clearance appears to be limited only by fear; I certainly got nowhere near touching anything down. The fact that I was even able to consider exploring the handling in the weather we enjoyed while we had the bikes is great testimony to the tyres and to the power delivery. While there is easily sufficient grunt to overwhelm the tyres if you’re ham-fisted, the progressive nature of the engine meant that you could wind on the power and not risk a sudden surge leaving you on your bum. At the same time, the standard Dunlop D207 tyres do a terrific job of harnessing all that torque and keeping everything pointing in the right direction. And the right way up. Now getting caught in the snow on a 100bhp bike is never going to be a relaxing experience, but I can say a few things for certain. When the Firebolt did slide, it did it progressively and it was very easy to catch and control. The brakes, while fearsomely powerful, are blessed with enough feel to allow fairly drama free retardation, even on a blanket of snow. And the enormous engine produces a very welcome amount of heat, allowing the use of lighter gloves, at least while riding in town, and so promising better control. But if you're at least vaguely sane, most of the time you won't be riding in conditions like that. So it's probably more relevant to talk about the riding experience in better conditions. The Firebolt is one of those bikes that simply fits. It's comfortable to sit on and easy to mount, no doubt as a result of its diminuitive size. The layout throws you into a semi racing crouch - far more comfortable than it sounds and ideally positioned to make the most of the handling. Like its sibling, the Firebolt is blessed with an engine with a long and gloriuos history. This means that it is slow revving and noisy, and attached to a truly nasty gearbox. It also means that it is incredibly strong, has more character than the entire model range of most other manufacturers combined, sounds fantastic when on song and will still be running when all the multi cylinder rice rockets in the world have crumbled to dust. And, anachronistic or not, the engine really suits the bike. On the open, dry but still rather cold road, the 1200cc lump never seems strained or frantic. It sometimes sounds a little asthmatic but I am sure that all it needs is a less restrictive exhaust to cure that. Even slightly reasonable cruising speeds are maintained with no fuss or drama at all, and in reality it isn't until you take a glance at the speedo, especially leaving a roundabout or junction fairly enthusiastically, that you realise just how fast this bike is. The impression of lethargy is reinforced as you take corners, especially corners you know well, because it feels as though you are way down on speed while, in reality, you probably have never been round there faster. Handling really is that good. Last year we raved about the 900 Firebolt on the track and on the road. 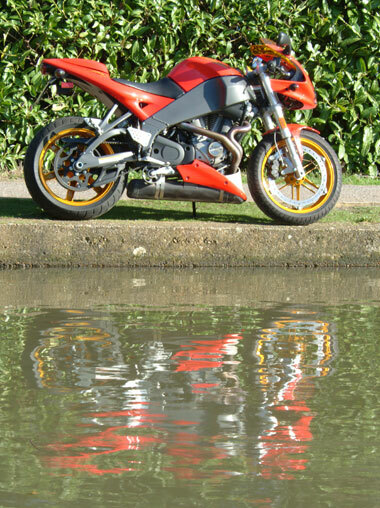 The 1200 is a better bike all round with all the good points and more power. 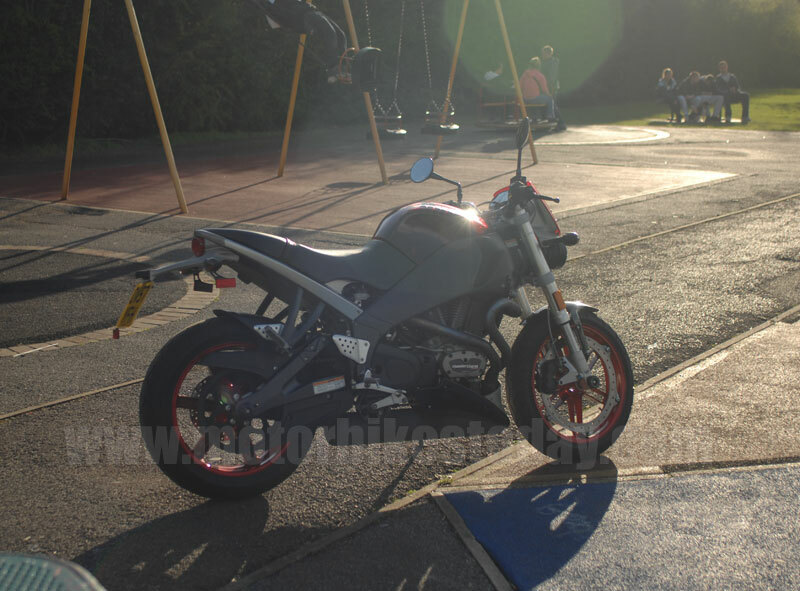 It is certainly the best, most fun, all round bike we've had so far this year. There's only one question left to ask. Did JK Rowling name Harry Potter's favourite broom before or after she rode a Buell? Copyright © Motorbikestoday.com 2004. All rights reserved. Users may download and print extracts of content from this website for their own personal and non-commercial use only. Republication or redistribution of content, including by framing or similar means, is expressly prohibited without the prior written consent of Motorbikestoday.